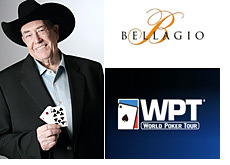 After an action packed day of poker, with a little controversy mixed in, the final table for the Doyle Brunson Classic is set, and will resume today at Bellagio. The final six players include a good mix of poker’s elite, up-and-comers, and unknowns. Headlining the field –and at the root of the controversial moments—is The Prince of Poker, Scotty Nguyen. Nguyen was involved in two incidents yesterday, one where he simply showed poor etiquette by ridiculing a player who was unaware someone had moved all-in before him –John Juanda verbally declared all-in, and did not move his chips and David Batista was wearing headphones. The second incident was a full breach of poker rules when Scotty flashed his cards with another player still to act. Nguyen currently sits in 2nd place in chips, trailing only Faraz Jaka: Top poker pros Daniel Alei and Josh Arieh are also still in the hunt for the coveted title. This entry was posted on Saturday, December 19th, 2009 at 8:24 pm and is filed under Poker News. You can follow any responses to this entry through the RSS 2.0 feed. You can leave a response, or trackback from your own site.